Who doesn’t love crisp, cooler weather, pumpkin-spiced lattes, and getting mesmerized by a roaring fire? The wait is over, it’s time to snuggle in, dim those lights, and get busy updating for fall. The official start of cozy season is here. Gone are the days when a toothy pumpkin on the porch was enough. Fall décor only starts at the front door now. Here, a round-up of fall updating ideas from Bassett Design Consultants and what they do in their very own homes. For a covered porch with an old school swing or rocking chairs, add colorful throws; you can also add baskets, or a wooden ladder propped with blanket throws on each rung (plaid, of course). A front door wreath, of-the-season accents like gourds and pumpkins are gracious ways to welcome visitors. Throughout your home, the most important thing to do is to add an element of warmth. Bring the outside in. Mixing rustic accessories with anything red usually does the trick. A roaring fire in the fireplace captures everyone’s attention. So, dress up that mantel with fiery colored leaves and branches gathered from outside and display them in a vase. Trade out accent pillows on your sofa and chairs. For an autumnal vibe, choose stripes or plaids in deeper hues of rich fabrics like velvet, boucle, or faux fur. 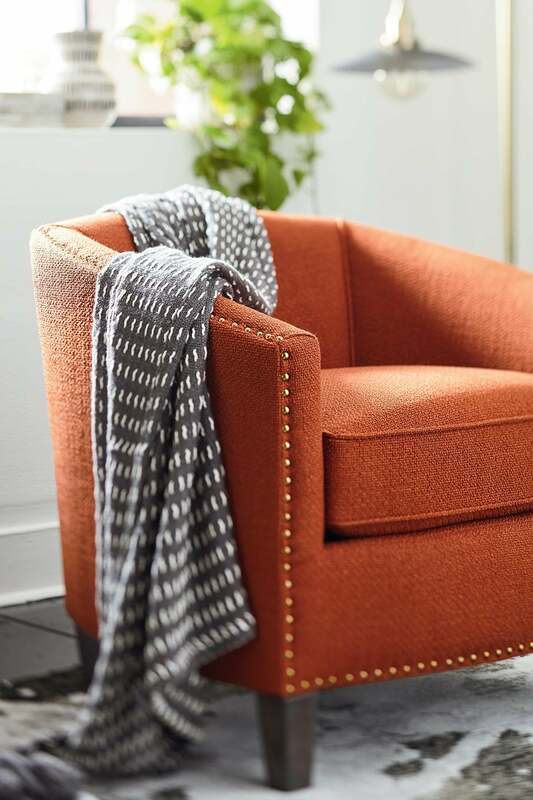 Combine colors in refreshing ways – “fall-ify” summery creams and whites with a pop of orange; or pair orange and green with your brown leather sofa and club chair and see how beautifully they work together. Rotate or rethink artwork, art pieces and accessories. Try different pieces in different places paired with different colors and textures. You may surprise yourself when you see new options come to life. What can you do in your dining room? Add a table runner, or better yet, layer your table runner. If it was a neutral color, pair it with a statement color. Next, gather pinecones, crabapple branches, and oak leaves for an easy fall centerpiece; nametags tied to tiny pumpkins will serve as festive seat place cards. Nothing says snuggle louder than a furry throw “spilling” out of a basket or at the foot of a bed. Elevate your slumber style to an upholstered headboard. And while you’re there, frame a favorite fall photo of loved ones for your nightstand. Let’s talk about rugs. Bring back any throw rugs or runners you banished for sandy feet. Now think about layering them. Get creative with textures and deeper colors as you finish updating your fall decor. Look up to the ceiling, and all around where you’re standing. What kind of mood do you want your lighting to set? To create a relaxing, intimate atmosphere, burn a scented candle and dim the lights. Dimmer switches are every designer’s go-to. Dimmers can save energy and save the lifetime of the bulbs inside the fixture. But before you buy, it’s important to know not all bulbs are dimmable; likewise, not all dimmers dim all bulbs. To work properly, the dimmer must match up to the fixture technology. Book an Appointment with a Design Consultant who can guide you with lighting selection. Shop now online or at a Bassett store near you. Apply for Financing to get your home ready for fall and all the memorable holidays to follow. Sign up for email and we'll let you know when cool things are happening.